Taiwanese electronics manufacturer Foxconn will set its North American headquarters in Milwaukee, Wisconsin, the company has confirmed. The firm has purchased a seven-storey building in the downtown area of the city from Northwestern Mutual Life Insurance, which will be refurbished to host 500 staff. The ‘611’ building will house various functions, including marketing and an innovation centre for startups. The HQ forms part of a wider $10 billion investment over four years which will also see the establishment of a 20 million square foot LDC panel plant employing up to 10,000 people in Wisconsin. Foxconn purchased Japanese LCD maker Sharp for $3.8 billion back in 2016. Foxconn has also agreed a partnership with the University of Wisconsin-Milwaukee that will see engineering students sent to the Chung Yuan Christian University in Taiwan, where they will be able to work at a Foxconn LCD facility. The idea is that they will return to complete their studies in the US before assisting with the launch of the new plant. “We are committed to supporting Wisconsin in expanding the existing strong talent pool and nurturing knowledge workers in the state,” declared Louis Woo, special assistant to Foxconn CEO Terry Gou. Foxconn is the world’s largest contract electronics manufacturer and employees more than one million people. 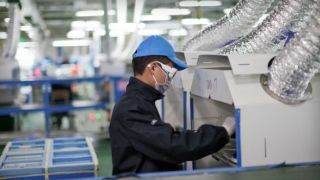 Its customers include Apple, for whom it assembles iPhones at its plants in China, but it has come under fierce criticism for alleged poor pay and working conditions that have reportedly led to riots, deaths and even suicides. The company has since worked to improve matters.